Find out how to add this glam, natural element into your home decor. ​Move over potted plants—there's a new natural trend happening in home decor. Colorful agate and geode pieces are popping up in all our favorite stores—and have quickly become our favorite way to add a little glamour and interest to our homes. Most often placed on display as objets on your shelf—stacked with books and other little treasures—we've noticed that these sparkling stones are becoming so much more! Agates have been transformed into almost anything you can think of—stunning chandeliers, colorful coffee tables, clocks and more. While we aren't suggesting you retire your green thumb and give up on greens entirely, we're totally on board with adding some natural elements into our homes that don't require constant care and attention. Ahead, we've sourced some unique and beautiful agate home accessories that are sure to add some eclectic style to any room in your house. All we can say is wow! 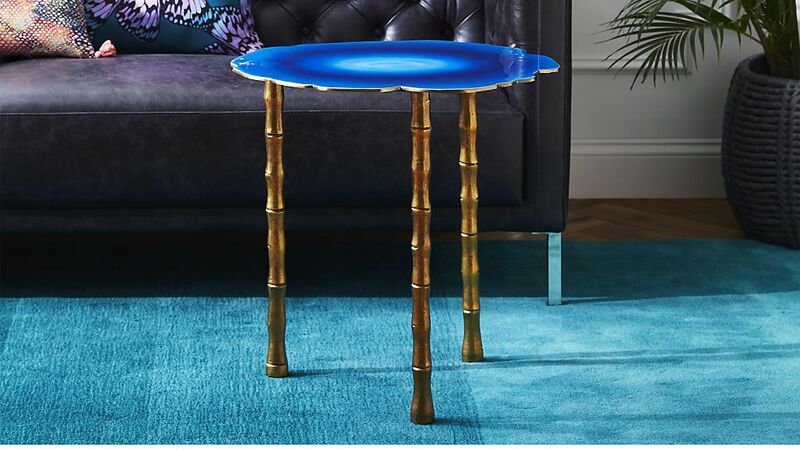 This side table is so stunning it will instantly become the centerpiece of your room—no matter if you tuck it into a corner or use a cluster of them as your coffee table setup. To create an instant and immediate sense of modern glamour with just a hint of mid-century in your dining room—hang this colorful agate chandelier above virtually any table. We'd keep everything else neutral and let this light literally shine. We love this affordable little "slice" of the agate trend you can find at Target. We could see a trio of these hanging above your bed frame horizontally, or vertically in a narrow hallway. The coolest thing about adding agate into your home decor is that it doesn't really have a specific "look." 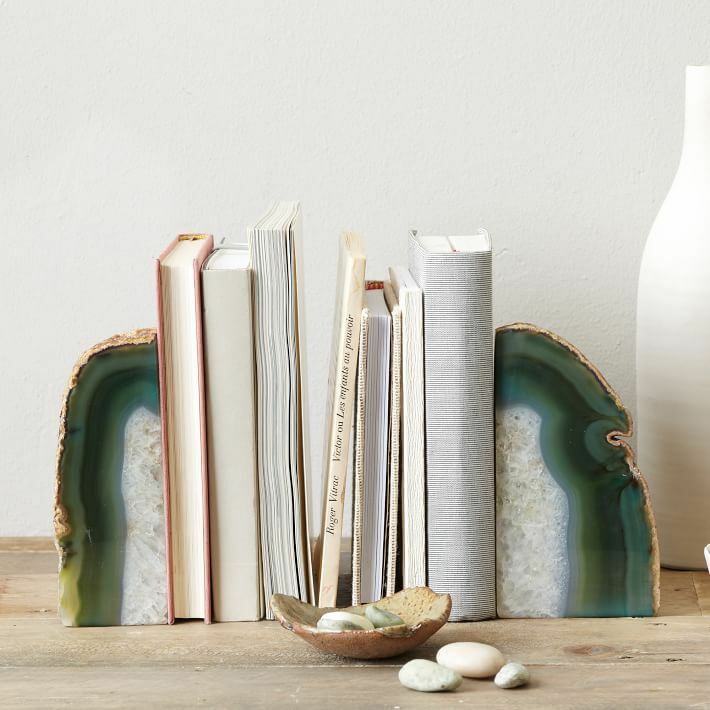 Agate bookends like these could work in any design scheme from preppy to modern. Set them on your hearth amongst picture frames and candles or give them a spotlight on a bookshelf or console table with all your favorite titles. So pretty you might even delay the start of your meal. These agate napkin rings we found at Crate & Barrel will bring some whimsy and style to your summer tablescape. These geode knobs are a best-seller from Anthropologie's website. Collect a mix of colors, shapes and sizes and give your kitchen cabinets or IKEA dresser an instant makeover. Cocktail hour has never looked so chic. These polished agate coasters would make the perfect gift for a housewarming or your favorite host or hostess. Once again, leave it to Target to have these gorgeous pieces at an affordable price. You could set these agate slices on stands just about anywhere—your vanity, a coffee table, bookshelves... We could go on. Give your coats and hats somewhere fancy to rest when they're not in use. These swirled agate hooks from Anthropologie will give your mud room some serious rustic-chic charm. Agate can be quirky, too. We love this made-to-order desk clock from ModNorthandCo on Etsy. With warm gold hardware, this clock is trendy and stylish but will easily work with the more timeless elements of your home decor. The agate trend has gone soft, too. This printed throw pillow cover actually comes in a variety of colors—throw a variety of them on your couch for an eclectic look that works together seamlessly. The neutral-hued slice of agate in this lamp adds just a touch of the unexpected to this rather sleek and unfussy design. We'd recommend this piece for anyone cultivating a sophisticated, modern look in their bedroom or den. Another great gift item, this white lacquer box with an agate knob is feminine and fun—perfect any woman's vanity or desktop to hold jewelry and other precious small items. We couldn't resist including just one more side table, they might be our favorite agate find of all. This version, which is available from Wayfair, has been cut and smoothed into a square shape. Set it next to your favorite accent chair or even use it as a surprising bed side table.